An original short film by award-winning filmmaker and photographer Lauren Greenfield, kids + money is a conversation with young people from diverse Los Angeles communities about the role of money in their lives.� From rich to poor, Pacific Palisades to East L.A., kids address how they are shaped by a culture of consumerism. "A very powerful and chilling window into what the commercialization of childhood really means in the lives of children growing up today. By telling the story through the voices of children themselves, Lauren Greenfield masterfully captures how marketing and money creeps into the hearts, minds and souls of today's young people--diverse girls and boys alike. It should provide us all with a deep sense of urgency to work to reduce the influence marketers and the world they have created is having on our children." "A fascinating look at LA teenagers from across the economic spectrum candidly talking about the importance of money and its ability to provide the clothes, cars, jewelry, bags and shoes that define who they are and where they fit in the social hierarchy. At times disturbing, at others poignant and touching, this film paints a realistic portrait of children growing up at the epicenter of an increasingly materialistic culture." 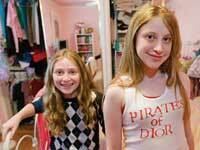 "It's impossible to watch Lauren Greenfield's short, smart film and not feel unsettled. It's not so much the way a hunger for money and signs of wealth consumes rich and poor alike; it's the way all those promises of freedom, choice, and individuality create, in fact, a poverty of imagination. This is a film to watch over and over. It takes time to adjust to the bright, glitzy subject matter and fully appreciate the subtleties of voice, desire, and relationship." "An excruciatingly clear and poignant look at the attitudes of early teens...Provide[s] in-depth portraits of a diverse group...Watching this provocative film will initiate lively conversations with your students." "This high-quality program is valuable for parent education or classroom use, especially to prompt discussion on the 'endless process of consumption.'" "Astonishing, disturbing, and even heart-wrenching at times. The film captures the desire of kids growing up in a materialistic culture and the powerful influence that marketing and advirtising have on them...Classes in government, economics, character development, and guidance as well as non-profit youth organizations can utilize this nonjudgmental, thought-provoking film as a springboard for discussions on consumerism, money, values, character, culture, and peer pressure." "Photographer Lauren Greenfield's kids + money is a piercing examination of the relationship between the two in the wealthier parts of L.A."
"Clearly Greenfield is respectful, however, to the subjects, instead of judgmental, which is likely why her subjects are so willing to open up." "When I arrived to the theatre an hour and a half before the screening there were already people in the Rush line, and that is true dedication." "I have always been an avid shopper and pride myself on my wardrobe. That said, it was a bit disconcerting to see the desperate importance these kids placed on having the right item in their wardrobe." "It's really a must-see and should make us all take a hard look at the values we are teaching our children." includes a comprehensive 43-page Educational Guide by Nathan Dungan (founder and president of Share Save Spend®) with photographs by Lauren Greenfield, scene selection and SDH captions as an option on the main menu.